With the USB port for device mode, one could present a virtual serial port over USB, connected to a real serial port. I already have one of these devices (in fact, a USB-to-serial adapter (or a USB-to-SWD adapter) was required to program the blue pill from a PC), but it’s a simple yet useful application worth touching on. 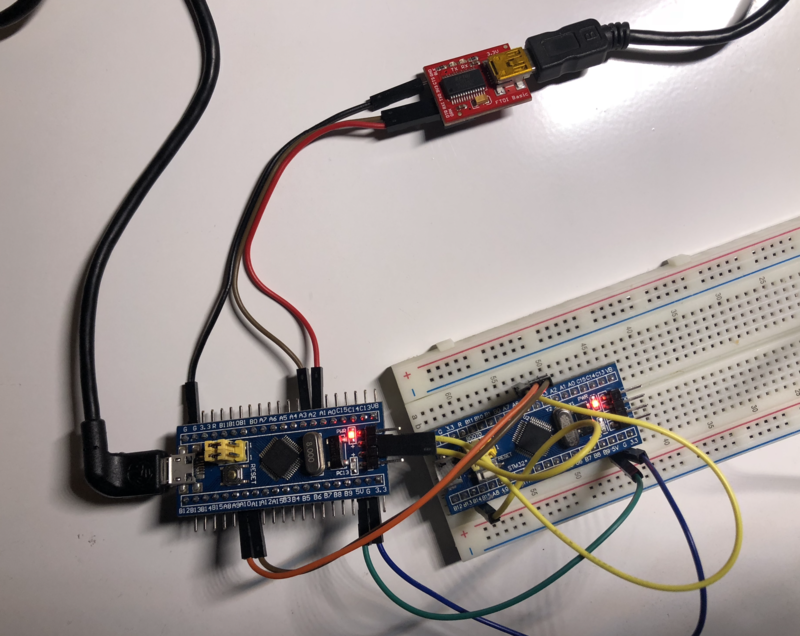 FTDI makes a [FT232R - USB UART IC], specifically for interfacing USB to serial. The chip is about $4.50/1 on Digi-Key, so Chinese manufacturers have taken to using alternatives: the SiLabs CP2102 or Olimex CH430. I’ve seen these chips on ESP8266 boards including those I used in The smart bulb / smart switch dilemma: smartening up a dumb wall switch. Requires installing their own drivers, but the hardware is cheaper. Case in point: 6Pin USB 2.0 to TTL UART Module Serial Converter CP2102 Replace Ft232 Adapter Module for $1.20 on Aliexpress. However, I use a genuine FT232, on this board: SparkFun USB to Serial Breakout - FT232RL, a steep $14.95. Didn’t know of the cheaper alternatives at the time. But this converter works well, so I don’t regret it. Supposedly there are USB-to-serial adapters available based on the STM32. It’s a practical application of the blue pill, but may not be the most competitive to alternatives. Works well. Now I can save a USB port and get rid of my standalone USB-to-serial adapter in favor of the Black Magic Probe’s built-in functionality. Some background on how USB implements what we see as a serial port on the PC. The bDeviceClass of device defines the device type e.g. a USB Mouse is a Human Interface Device (HID) class device. This is given a hex value of 0x03. More complex devices such as Communication Device Class (CDC) may also use a sub class to break down the device type into a smaller group. bProtocol is used to qualify the sub class. There are two places on a device where class code information can be placed.One place is in the Device Descriptor, and the other is in Interface Descriptors. * Control Model (CDC-ACM) as defined in CDC PSTN subclass 1.2. Telephone Control Model, for voice telephony devices. The abstract control model, used for modems controlled through.. serial. Seems like a roundabout way to get serial, but that’s how it was done. And this explains why my computer recognizes these devices as “USB modems”, with /dev/tty.usbmodem device nodes. When developping on a USB-enabled embedded microcontroller that needs to exchange data with a computer over USB, it is tempting to use a standardized way of communication which is well supported by virtually every operating system. This is why most people choose to implement CDC/PSTN with ACM (did you notice that the Linux kernel driver for /dev/ttyACM0 is named cdc_acm?) because it is the simplest way to exchange raw data. Direct Line Control would be exchanging data with the modem through an audio class, Abstract Control lets the modem perform hardware analog functions, as instructed to over serial, but this conveniently happens to be useful for non-modem purposes. In contrast, ttyUSB devices are proprietary UART to USB bridges. FTDI and Prolific have their own. With other vendors you may need to install custom drivers, e.g. SiLabs CP2102 drivers which I mentioned in STM32 Blue Pill ARM development board first look: from Arduino to bare metal programming as being present on some ESP8266 boards and inexpensive USB-to-serial converters. Installing proprietary drivers is a pain, and trying to implement to the spec of a 3rd party proprietary driver runs the risk of incidents like FTDI admits to bricking innocent users’ chips in silent update. Hackaday: Watch that Windows Update: FTDI drivers are killing fake chips. Given this, using the USB CDC ACM instead seems reasonable. USB-to-serial is cool and all, but how about we take it a step further? The STM32 has three UARTs, so how about a USB to three serial ports? We could call it USB-to-serialx3 or USB to triple serial. Map each of the serials to a virtual serial port over USB using a composite device. Then this blue pill serial adapter would be three times more useful than the garden variety bargain basement singular USB-to-serial, in theory. Refer to the libopencm3-examples. The stm32-h103/usb_cdcacm example looks instructive, as it “implements a USB CDC-ACM device (aka Virtual Serial Port) to demonstrate the use of the USB device stack”, Atmel’s Migrating from RS-232 to USB Bridge Specification application note (2003) explains how to use the Communications Device Class, Abstract Control Model, to implement a “Virtual COM port”. That’s what we want. For important nuances and gotchas in using these examples, see my earlier experience with developing pill_blink. Now when the USB cable is plugged in, the PC13 start starts off, then flashes quickly and turns on once connected to the host. as expected, it continuously prints “12345678901234567890123456789012345678901234567890123456789012345678901234567890” then a newline and repeats indefinitely. So this port is working. Typing does nothing since RX is not configured, only USART1 TX PA9, connected to Black Magic Probe’s PA3. Try the other ports: connect Black Magic Probe’s PA3 to the target blue pill’s A2, and then disconnect and connect to PB10. In all three cases, the characters are received. So far so good. Last usart example, usart_printf, is almost exactly the same except not using IRQs. Many other examples also use the USART. connect to each virtual USB serial port on the PC, type keystrokes and watch the characters flow.